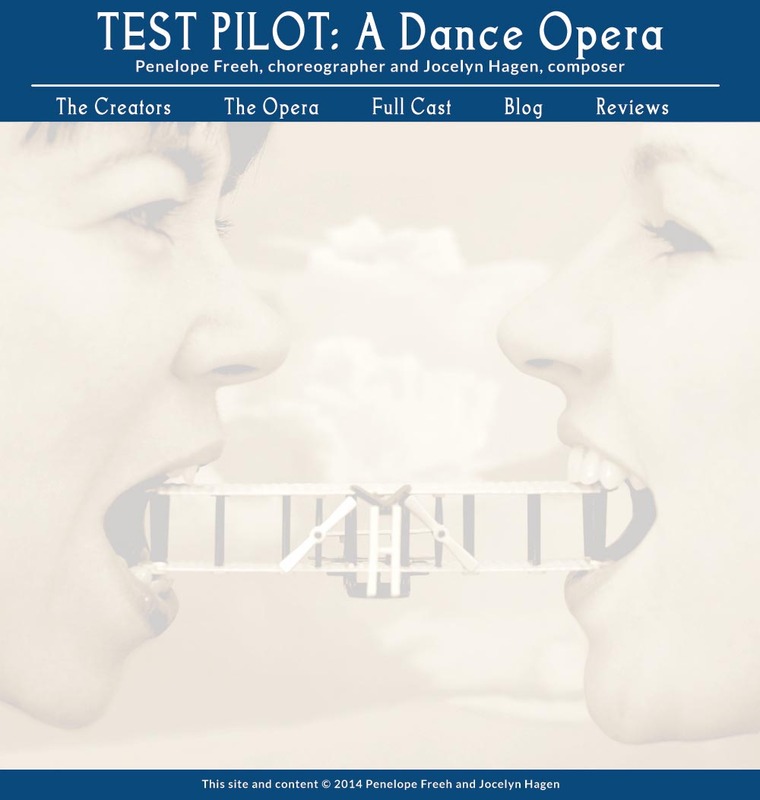 Test Pilot, an intimate chamber dance opera by choreographer Penelope Freeh and composer Jocelyn Hagen, explores the power and wonder of creativity and invention through the birth of flight and the story of the Wright Brothers. Their sister, Katharine, is an often overlooked member of the Wright family, and her contribution to the family and their success is examined in this work through song and dance. The creators' personal family legends and aviation heroics are also woven into the oblique narrative. Test Pilot premiered September 12-13, 2014, as part of The O’Shaughnessy Women of Substance Series and utilized a string quartet, six singers, four dancers and a video artist. The overarching narrative is told from the perspective of Katherine Wright, Wilbur and Orville’s sister with whom they exchanged letters recording the historic events in Kitty Hawk, NC. This role is sung by a soprano. Two unvoiced male dancers portray the brothers; two female dancers portray the airplane. Five male singers serve as the witnesses who were present for the “first fight” in 1903. Freeh and Hagen wrote the libretto ourselves, assembling a collage of texts from preexisting documents. Though specific roles are represented, the players are also used to enact more imagistic and impressionistic scenes. Video projections, “found sound” (i.e. propellers, wind tunnel noise, songs of the day, etc.) and looping technology are incorporated as well as textural elements including but not limited to: air quality, weather patterns, the repetitive trial and error process of invention and humanizing the mechanized (how can people represent a contraption?). Freeh and Hagen also experiment with sourcing the everyday thoughts and actions behind flight: the “pilot’s alphabet” (A: Alpha, B: Bravo, C: Charlie…), the protocol of pre-flight checks and runway worker and flight attendant physicality.